Brabus Rocket as you now is an extreme version of the Mercedes CLS built by the German tuner. Here’s the latest version based on the 2012 model, and it’s a beast. It is powered by a Brabus 800 V12 Biturbo engine that produces 800 hp (788 bhp) / 588 kW of power and a peak torque of 1,420 Nm (1,047 lb-ft), which in the car is limited to 1,100 Nm (811 lb-ft). The exclusively appointed Brabus Rocket 800, built to order starting at EUR 429,000, reaches a top speed in excess of 370 km/h (230 mph) and accelerates from 0 to 300 km/h (186 mph) in just 23.8 seconds. 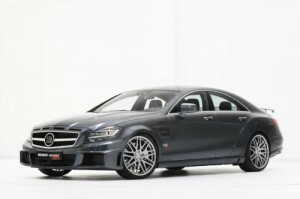 For the first time the Brabus engine specialists combine this high-end engine with a seven-speed quick-shift gearbox. Gears are shifted by means of shift paddles on the steering wheel or automatically. The Brabus limited-slip differential, available with various final drive ratios, optimizes traction of the rear-wheel-drive car. This is the ultimate CLS! 0-100 km/h (62 mph): 3.7 sec. 0-200 km/h (124 mph): 9.8 sec. 0-300 km/h (186 mph): 23.8 sec.